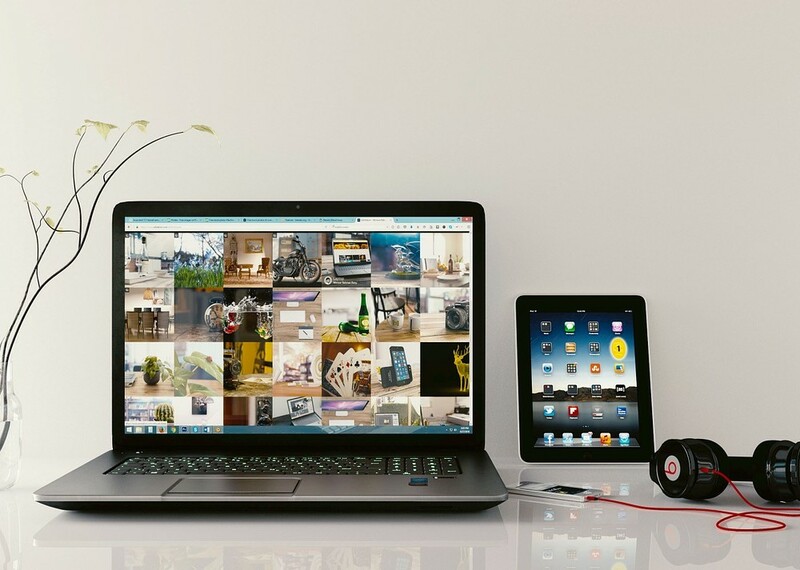 There are many factors to having a successful online store (it’s not just about the product). Dynamic design, diverse layout options, integrated promotion platform, ease of check-out (the process has to be seamless) and a back-end system that manages your store successfully. When looking at a WordPress Template designed specifically for selling online you want to make sure your grid and layout options are plenty. Not only do you want to display your product beautifully but in different styles and formats to appeal to different customers. Don’t forget to consider promotional tools for shopping carts. Check that each item can be tagged and shown as sale, featured or new, and promotional codes and deals can be integrated easily if not already included. The one thing to always remember is the shopper. It’s all about the user experience and landing a lifetime customer. Check out this weeks list, 10 free eCommerce themes. All templates are housed in the WordPress database with one-click download. 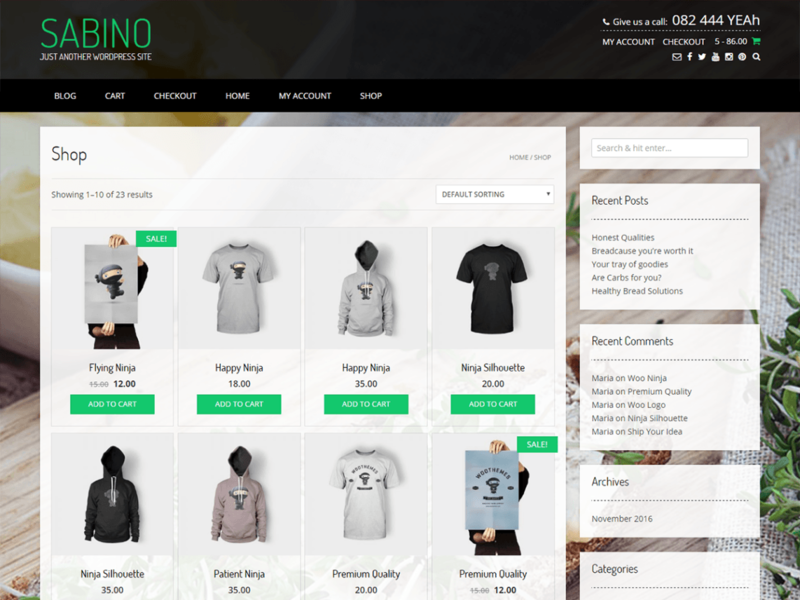 Sabino is a creative, elegant multipurpose eCommerce/WooCommerce WordPress theme designed especially for WooCommerce shops, business / restaurants, food critics, restaurant bloggers, health stores, Wellness shops, beauty stores and more. Sabino packs a bunch of customization settings all built neatly within the WordPress Customizer, the Sabino theme is very customizable with lots of settings and comes with 2 header layouts, 4 blog layouts, multiple page templates, 3 footer layouts and WooCommerce shop layout settings, giving you the flexability to customize the Sabino theme to fit your own custom design. Sabino integrates nicely with top WordPress plugins such as WooCommerce, to turn your website into an online e-commerce store. 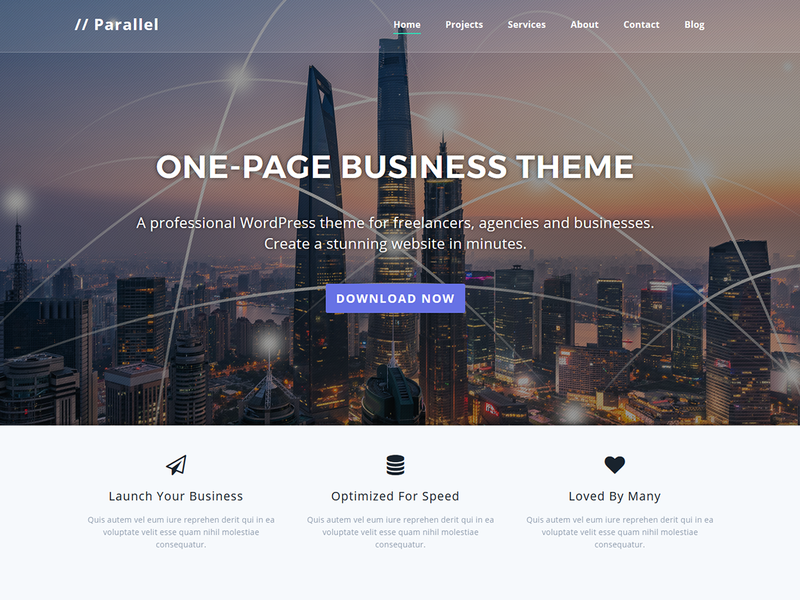 Build any page layouts with the multiple page templates given and the recommended, easy to use, drag and drop Page Builder. Install it now and start building your site without any coding knowledge. Vogue is the theme you want! A very easy to use, highly customizable, quick and simple to setup responsive, WooCommerce ready, multipurpose eCommerce WordPress theme. Vogue offers multiple header layouts, WooCommerce design, mulitple footer layouts, multiple blog layouts and a bunch of customization settings, making it possibe to use Vogue for any type of website from a simple blog displaying your personal portfolio, e-commerce store, to a corporate business website for your agency, online community, restaurant or real estate purposes, to selling products for your fully functional online eCommerce store. 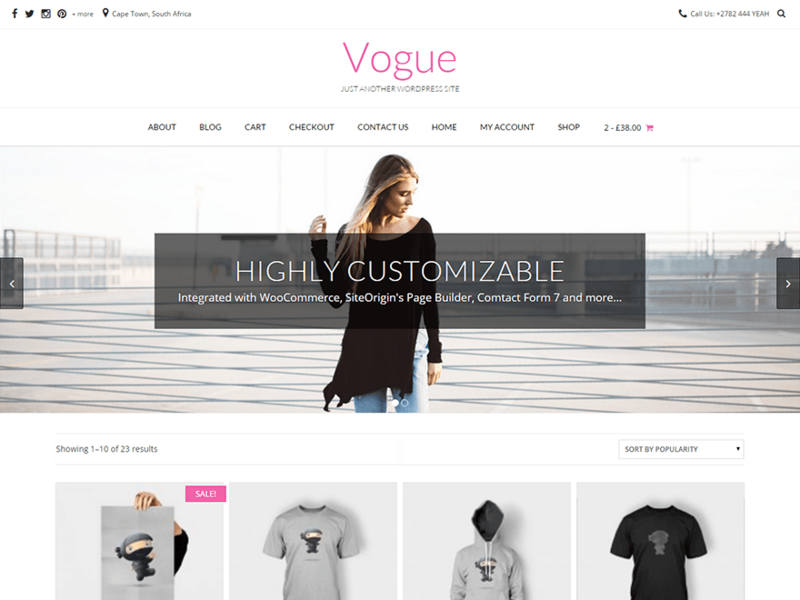 To turn Vogue into an online shop simply install the WooCommerce plugin and start selling your own products in no time through your own WordPress eCommerce shop. Vogue features a clean, simple, minimal and elegant style design which will work perfectly for almost any kind of store. Vogue is fully responsive and translation ready! 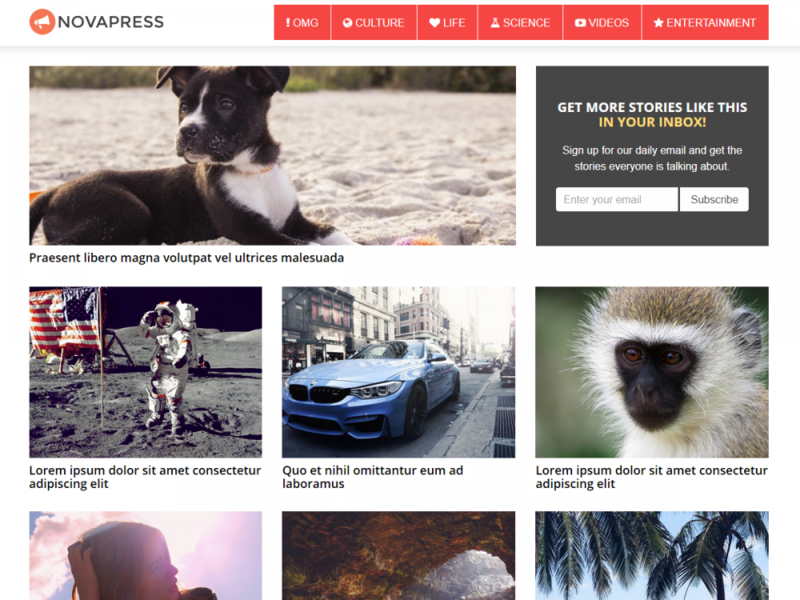 Used together with SiteOrigin’s simple drag and drop Page Builder and the multiple page templates & layouts Vogue offers, you can easily build beautiful page layouts without any coding knowledge. Vogue integrates seamlessly with the following popular free plugins: SiteOrigin’s Page Builder, Beaver Builder, BuddyPress, Contact Form 7 and WooCommerce… and there’s lots more coming… Get in contact and let us know which features you’d like added! Nikkon is a creative multipurpose WordPress WooCommerce theme designed with a minimal, clean, basic design. Nikkon offers multiple header layouts, multiple footer layouts and multiple page template layouts so along with SiteOrigin’s simple drag and drop Page Builder you are really able to built any type of website you desire. Nikkon will work great for a simple personal blog, beautiful fashion store, online photography portfolio, or a full eCommerce online store by simply installing the free WooCommerce e-commerce plugin. Build your online shop and start selling your products in no time on your own WooCommerce store. Nikkon integrates nicely with top free plugins such as SiteOrigins Page Builder, WooCommerce, Contact Form 7 and more. Simple, elegant, clean and beautiful, Nikkon offers great design for any website from a fashion shop to your corporate company business website. Shopper WooCommerce Responsive WordPress Theme is great theme for any ecommerce shop, with clean design and minimal layout. 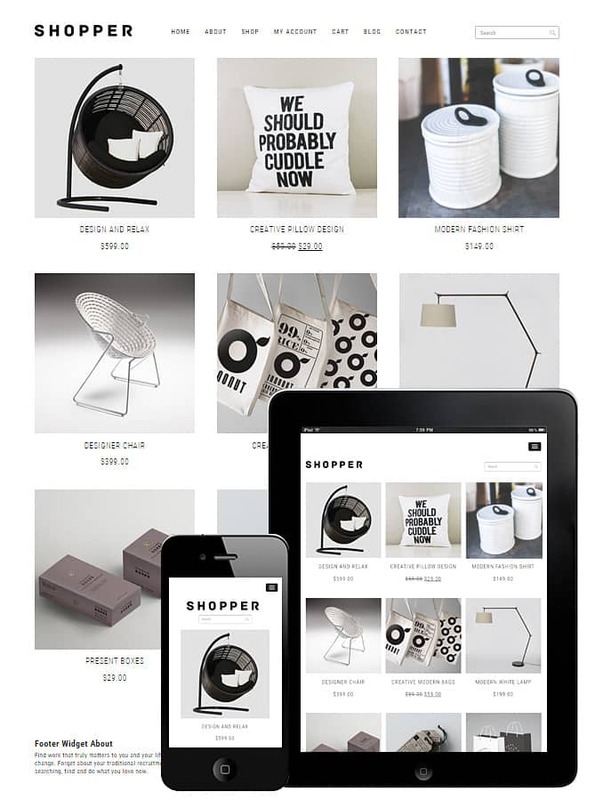 Shopper ecommerce theme has minimalist style and mobile friendly design. 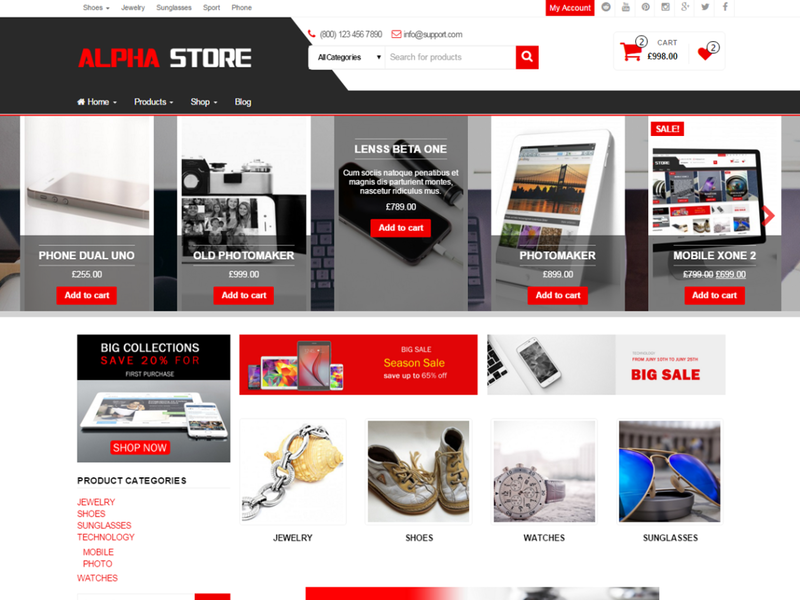 Alpha Store is a modern free WooCommerce WordPress theme especially designed for shops and eCommerce sites. It could be used for all types of ecommerce online stores, including: Fashion, Shoes, Jewelry, Watch, Sport, Technology, Mobile… Alpha Store is easy to use and fully responsive. It comes with an eye-catching layout design that will instantly draw the attention of anyone who visits your website. Theme is translation and multilinual ready. Alpha Store is SEO friendly helping you to achieve the highest positions on Google and optimized codebase to maximize your site’s performance and loading speed. The Theme Customizer is truly magaic tool to customize theme with pre-defined parameters, no coding is required. 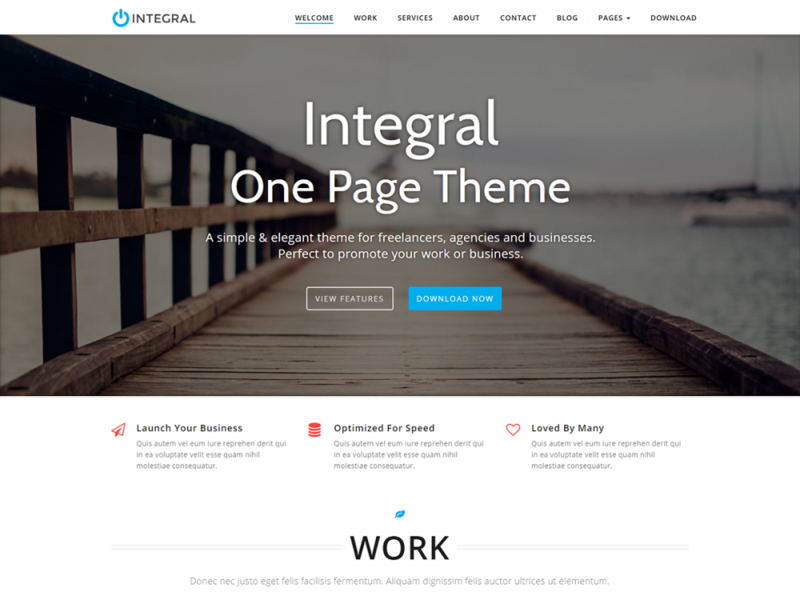 Theme is developed using CSS3 and Bootstrap with smooth HTML5 animations. 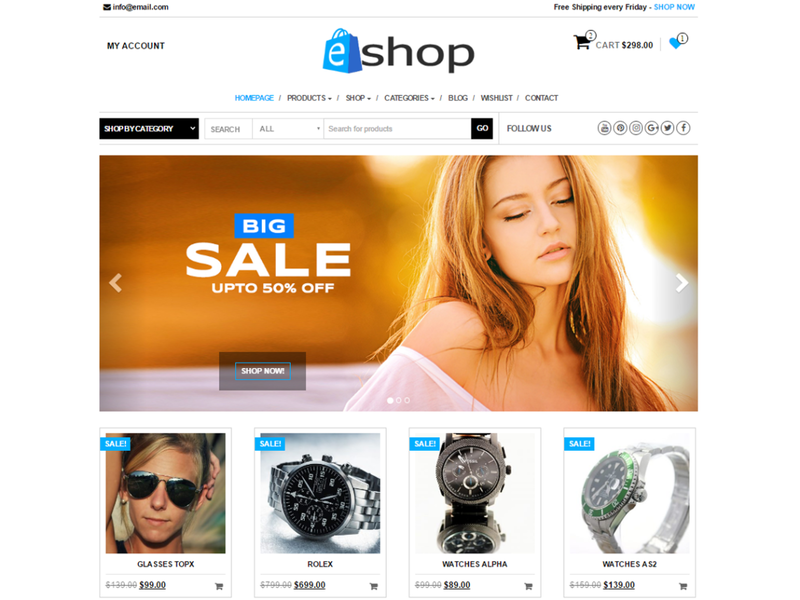 EightStore Lite – is a free Ecommerce, WooCommerce theme to help you build online store easily. This theme is probably the most feature-rich free WooCommerce theme, which allows you to create your online store in just no time. Some of the major features include: Beautiful design, boxed/full width layout, highly configurable home page, product slider, advanced wishlist, Featured product show list, youtube video integration on popup banner, multiple category display layout, product and post search, promo ticker, payment/partners logo showcase, call to action, blogs on home page, testimonials, 4 sidebar options, typography option, fully responsive, browser compatible, bbPress compatible, CSS3 Animaton,Translation ready, RTL support, SEO friendly, fast loading. Envo Store is really fast, clean a modern, responsive WooCommerce WordPress theme that has an eye-catching design. 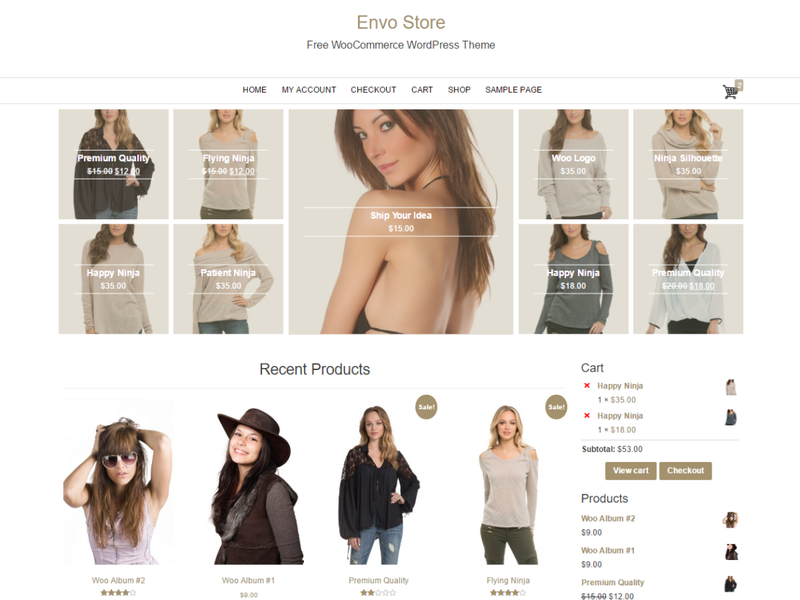 Envo Store is super fast and SEO friendly WordPress Theme. 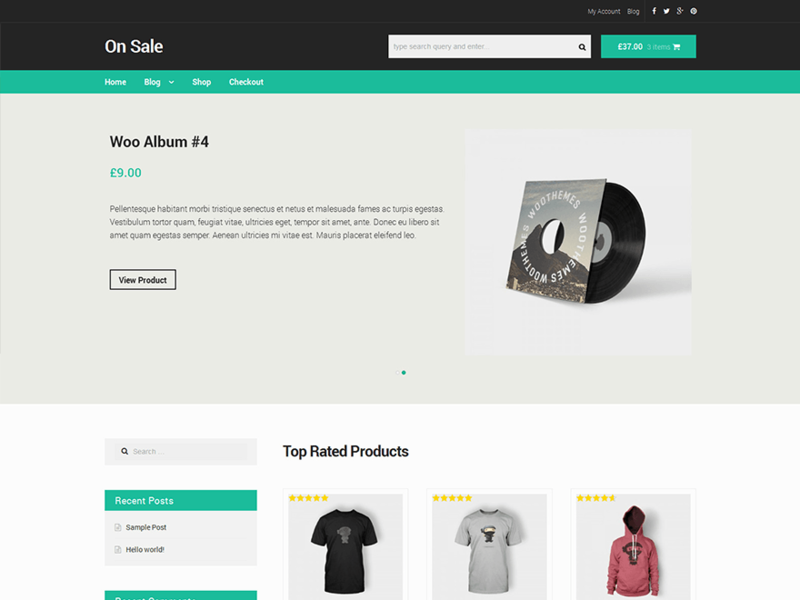 On Sale is a clean and crisp child theme for the WooCommerce reference theme Storefront. You must install Storefront before using this theme. On Sale has a simple color palette which can be edited in the customizer with no coding required. You also have the ability to set your logo, favicon and page layout options in the customizer meaning you can easily edit the theme to suit your brand look and feel. The home page product slider is great way to feature your latest and great products.